Chancellor Ronnie Green will launch the University of Nebraska–Lincoln's 150th-year celebration with a look at the past, review of the current state of campus, and reveal of a vision for the next 25 years. The examination will be featured in Green's State of the University address, 3:30 p.m. Jan. 15 at the Lied Center for Performing Arts, 301 N. 12th St. The speech, which is free and open to the public, will also be available live online. A reception featuring Dairy Store ice cream follows the lecture. The address outlines priorities for the university in the coming year. 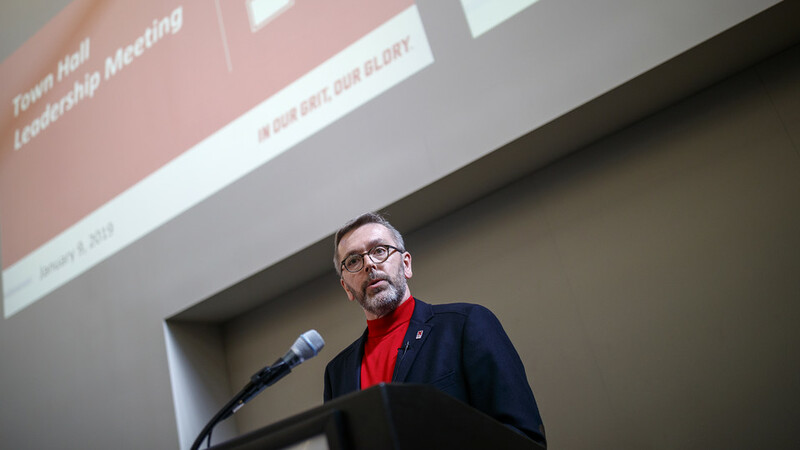 It is traditionally held at the start of the fall semester, but it was shifted to align with the start of the university's 150th anniversary in 2019. Green’s lecture will feature three sections — a review of the university’s history; an assessment of the last 18 months since the Sept. 17, 2017 State of the University address; and an review of the N150 Commission report, which outlines core aspirations for the next 25 years. The N150 Commission report will also be made available to the public following the State of the University address. Nebraska’s Commission of 150 assembled March 29, 2018 to begin developing a vision for what the university should become during the next 25 years. The commission’s charge was to develop a broad, bold plan for the future, even as the university celebrates its achievements of the past 150 years. The commission includes more than 150 students, faculty, staff and administrators. Learn more about the commission. Its work has been led by by co-chairs Will Thomas, professor of history, and Donde Plowman, executive vice chancellor and chief academic officer.